It’s a very pleasant 5½ hour drive from Boston to Bar Harbor, Maine. Once you leave Boston, the buildings get shorter and within 30 minutes we were well into the tree lined countryside. It’s pretty much all highway till you get to Augusta Maine. Then its the local Route 3 for the last 90 or so miles to Bar Harbor. 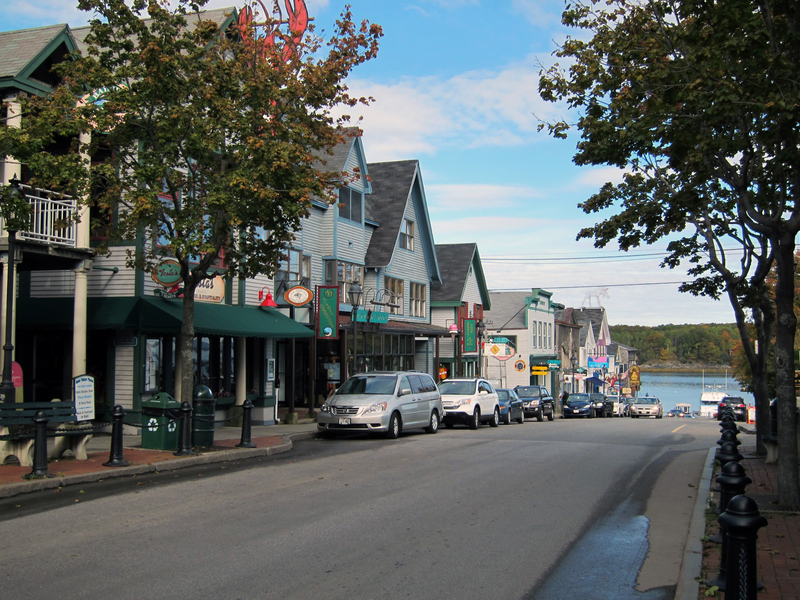 Bar Harbor nestles into the northeast corner of Mt Desert Island, the 2nd largest island on the US east coast. Long Island NY is the largest. The Abenaki Indians, who have been traced back to 3,000BC, called the island “Pemetic” or sloping land, which isn’t a bad explanation for a mountain. By the way, there is no mountain named Mt Desert on Mt Desert Island. The name comes from the French explorer Samuel de Champlain who called the island “Ile des Monts Desert” or island of bare mountains. Bar Harbor has a winter population of around 3,500. It swells up over 50,000 in the summer with tourist, summer residents and cruise ships. This is a town that loves tourists. You can tell by the amount of tee shirts and nic-nacs in the shop windows. 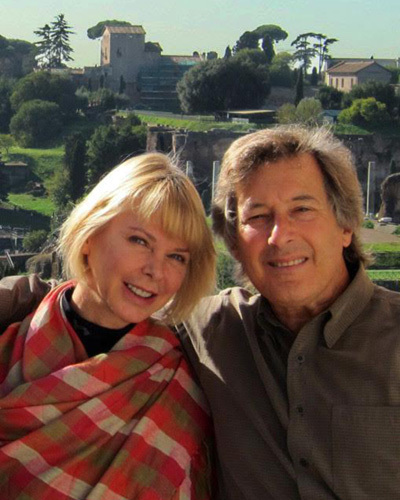 This small harbor town has been a favorite vacation destination, mostly for the very wealthy, since the turn of the 20th century. Some of the carriage paths in the Acadia National Park were built for John D Rockefeller Jr between 1915-33. A fire in 1947 destroyed much of the park but with the help of the Rockefeller family it’s all been restored and all the trees grew back. Sometimes a forest needs a fire to help clean it out. 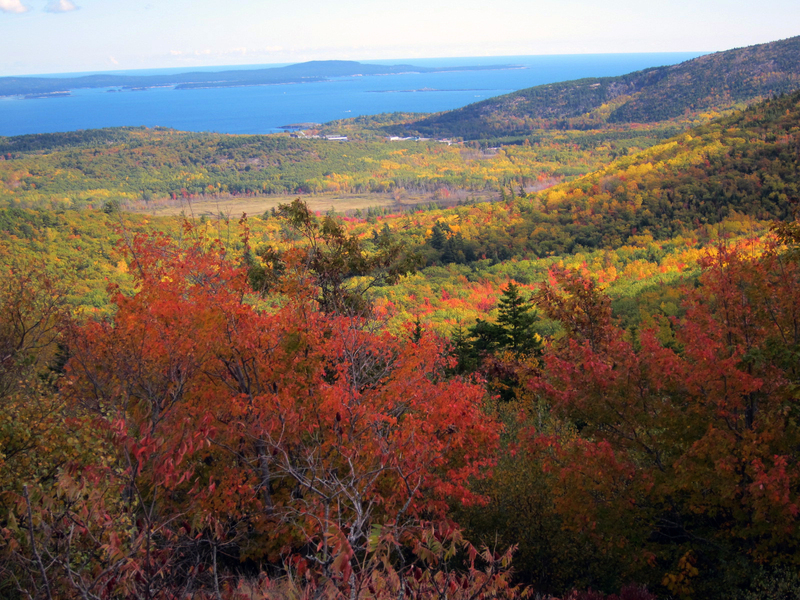 Acadia Park is also the home to Cadillac mountain, the first place to see the sunrise in America. It was named after the French explorer of North America, Antoine Laumet de La Mothe, sieur de Cadillac, who was granted possession of the Mt Desert Island in the late 1600’s by French King Louis XIV. Cadillac later went on to discover Detroit , a city that later on named one it it’s most famous car after the French explorer. The trails of the park are relaxing and easily accessible by foot, bicycle or horse. You can also rent a carriage and ride through the Park like the Rockefellers. The roads are resplendent with autumn leaf colors. 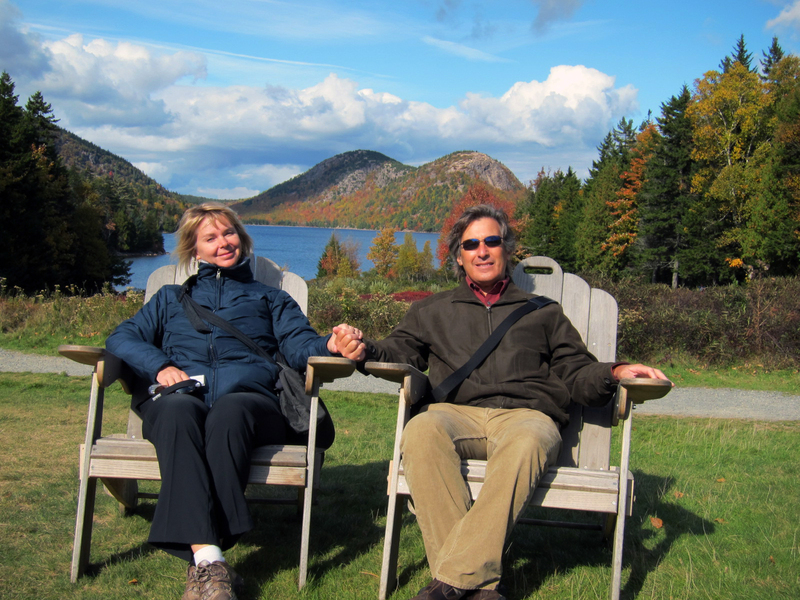 After a short hike around Cadillac mountain peak, we stopped for lunch at the restaurant at Jordan Pond House Restaurant and dined on their famous lobster stew and popovers before taking another short hike along the pond. The lake has been a favorite picnic spot since the 1800’s. The restaurant has been there since 1870. 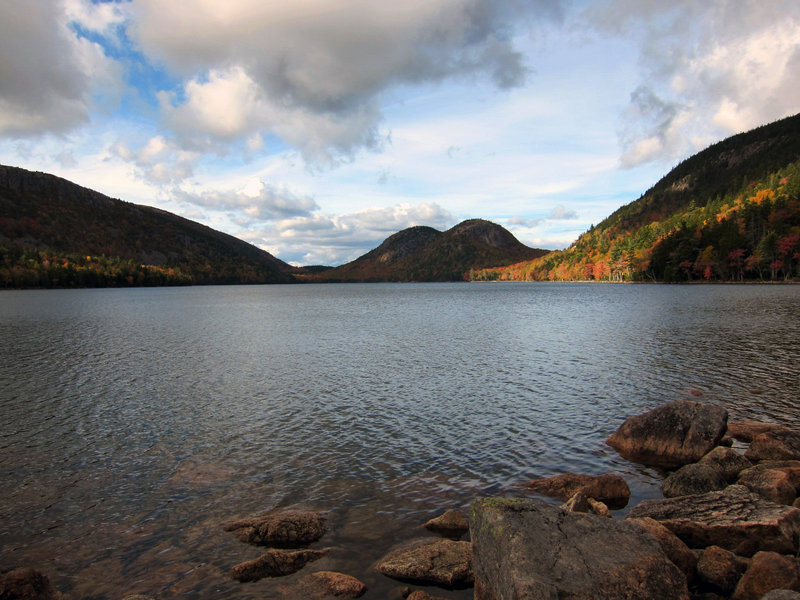 Jordan Pond is 150 feet deep and is clear all the way to its granite bottom. In order to preserve the clarity of the water, no swimming or boating is allowed. If you’re lucky you might see some of the wildlife; moose, beaver, muskrat, porcupine, bobcat, fox or black bear. But even if you don’t see a moose or a bear, I guarantee you’ll see a lot of Maine Lobsters. The menu cards of all the restaurants read like the Bubba shrimp speech from the movie “Forrest Gump”. They barbecue it, boil it, broil it, bake it, sauté it. There are 1 1/4 lb lobsters, 2lb lobsters, 2.5 lb lobsters, boiled lobster, stir-fried lobster, lobster bisque, lobster stew, lobster eggs benedict, lobster omelet, lobster biscuit, lobster Cantonese, lobster enchilada, lobster roll, lobster salad. I think you get the picture. 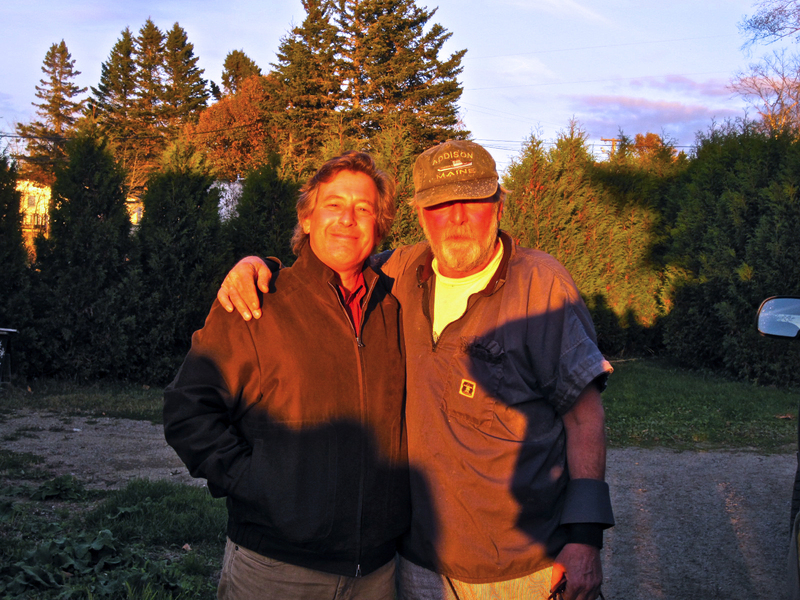 An old friend of mine has been a lobster fisherman way “down east” Maine for the past 40 years. He lives in a small town called South Addison Maine, a little less than a 2hr drive northeast of Bar Harbor. 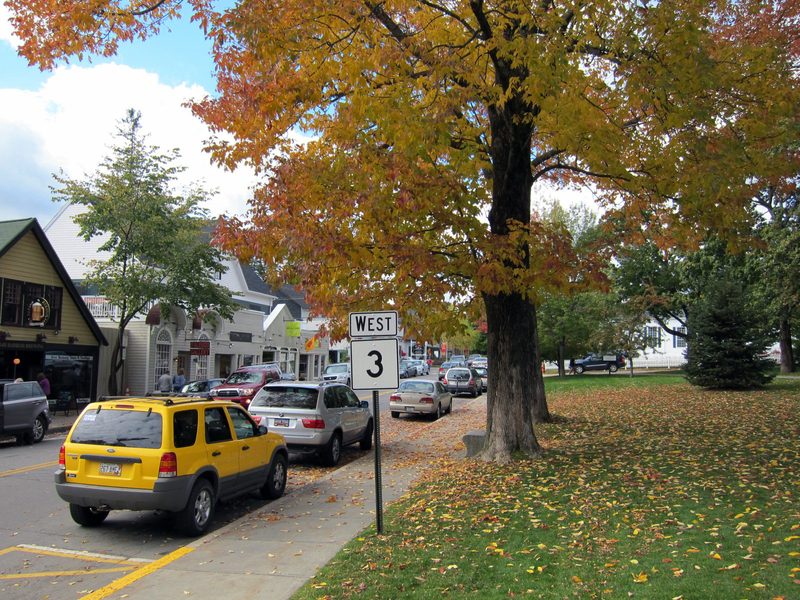 The town center is comprised of a church, a small post office and a garage/bait shop. Everyone in town knows each other and so when a new car comes into town, news travels fast. They do have their share of summer tourists who provide some extra cash and a few headaches into the local economy. A couple of years ago the tourist trade prompted the town to erect a “Blind Man Walking” caution sign in the town center to protect one of the residents. In the late 1960’s, my friend Oscar was a handsome joy filled hippie with hair down to his waist. Now he’s a 60’s lobsterman with a ruddy red complexion, short grey hair and a grey beard. It’s a hard life but he loves it, aches and pains and all. He still gets up with the dawn and hauls lobster traps till sunset. The new hip that went in recently is helping out a lot. We met up with Oscar around 5:30pm and after a few minutes at the house, we got back in the car a followed him down to the Lobster pound to, as he said, “ pick up our suppah”. 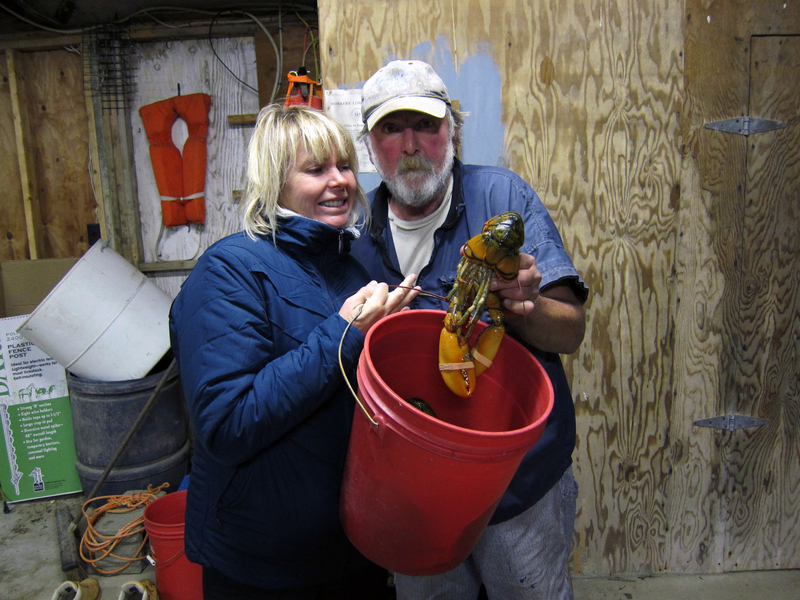 The Lobster pound is a man made sea corral where Oscar and his partner keep the catch. By his estimation there are over 50,000 lobsters crawling around down there. The water temperature needs to be watched, the pound needs to be protected from lobster poachers and they need to be fed at least once a day with their favorite snack, salted herring. The fishing season is best in the summer and fall but lobster prices go down when the catch goes up. In the winter time the price of lobsters can double. Oscar refers to the Lobster Pound as “Lobster futures”. In the late summer and early autumn most of the lobsters consumed are referred to as “shedders”because they have just shed their hard shells and the new ones are growing in. The lobster has to shed the old shell in order to grow. The new shells are soft and filled with a lot of liquid. You can break them open with your hands. The locals twist the shell off, causing a flow of liquid to hit the plate and giving the nickname “dishrags” to the shedders. We dined on lobster and local crab and talked of many things, of college days and families and cabbages and kings. It was a great night. We didn’t get back to Bar Harbor till close to midnight. Our last day in Bar Harbor we got hit with a classic “nor’easter”. 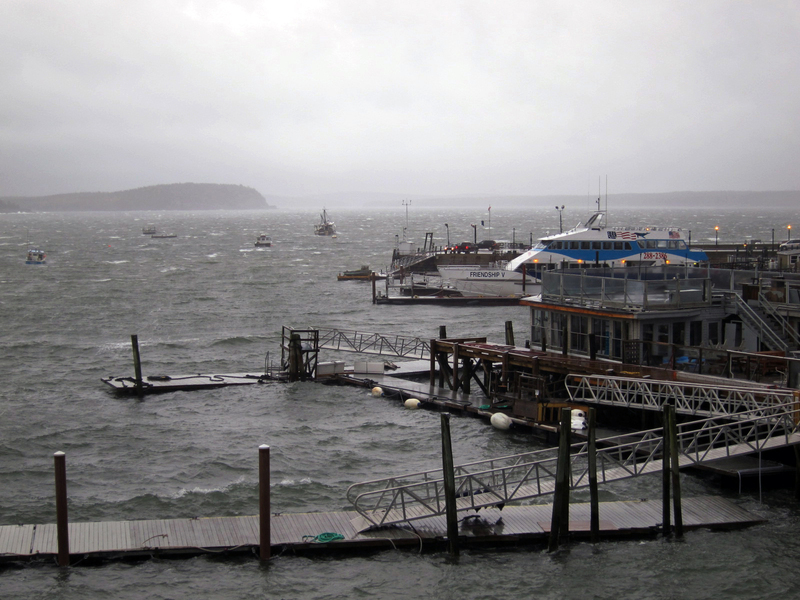 The storm kicked up 40 mph winds and dumped horizontal and vertical sheets of rain over Bar Harbor. The winds tore the canopy off the hotel restaurant, clattered and rattled the patio door of our hotel room, but we stayed safe and warm inside. Hey, there was free WIFI. We were pleasantly entertained all day. Our room at the Harborside Hotel has a terrace overlooking Frenchman’s Bay and we got an excellent view of the storm. The winds finally stopped around 4pm and we went out for a walk and eventually to our last lobster dinner. 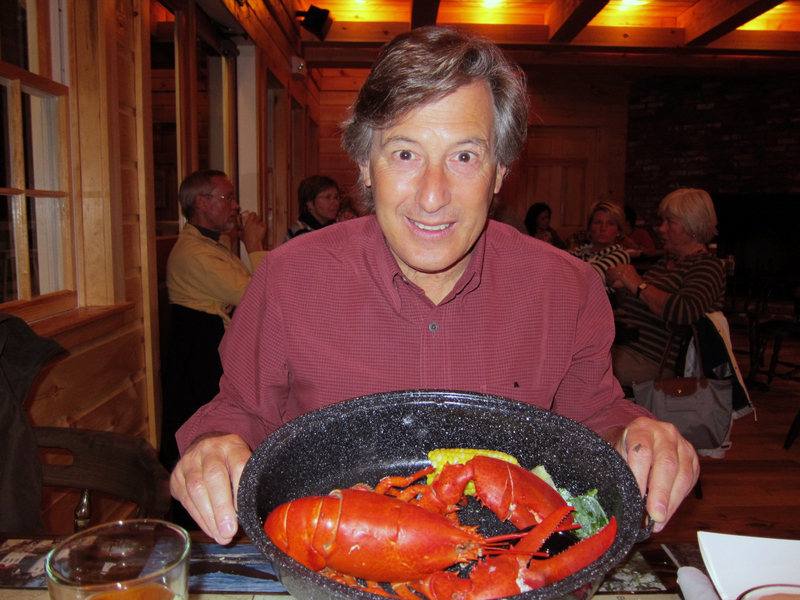 I can honestly say, I’ve eaten enough lobster for a while.